An early evening stroll amongst the iconic architectural structures that comprise the famed Art Deco district of Miami Beach yields exquisite vintage postcard scenes of hotels and restaurants set against a watercolor-inspired sky awash in the soft, golden tones of the setting sun and accented with subtle hints of blues and greens. The sky high above the Shore Park and Pelican hotels subtly shifts from a light gold to an almost moody, yet barely there green with traces of blue. A tiny bit of sky-blue peeks out from behind the gold-edged clouds floating serenely above the Bentley hotel. 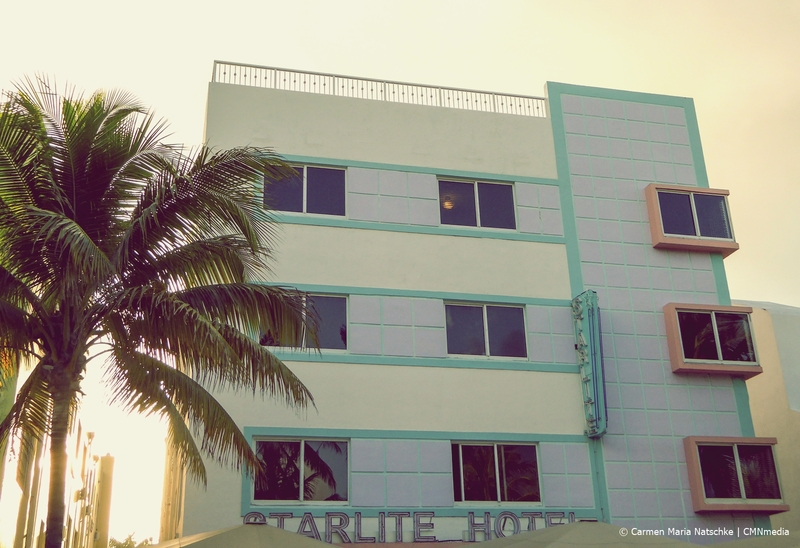 The setting sun casts a sky of ombre golden tones from the sublime to the dramatic offering an awe-inspiring backdrop for the iconic Starlite hotel. A pastel yellow sky offers a gentle, harmonious setting for the Avalon’s own pastel green, yellow and orange facade. Cross-posted from Carmen Maria Natschke|CMNmedia.